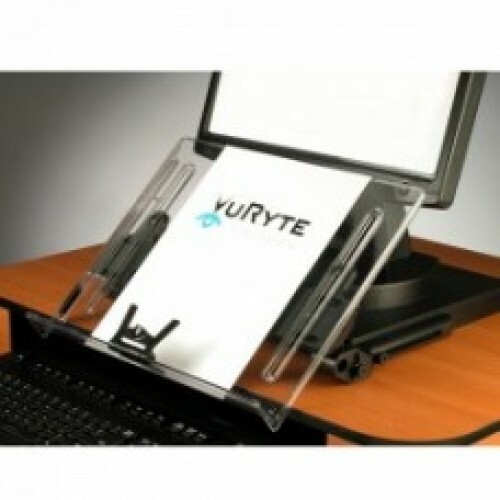 VuRyte Vision Vu Document Holder & Monitor Riser 14in. 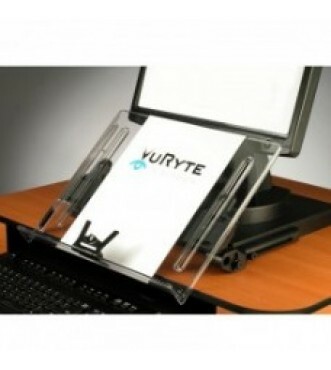 Ergonomic In-line document holder adjusts four ways: Depth, vertical, horizontal & angle. Easel is 14" wide clear acrylic. Attached to VuRyser base . Raises monitor height 1". Adjustable in height and angle and depth and vertical and horizontal planes for a plethora of workstation designs. Easel is fully adjustable in angle. Easel is CONNECTED to a 1 inch monitor stand to provide maximum stability and support. Monitor stand measures 11 3/8” x 11 3/8” x 1” and supports 60 pounds. Ideal for keyboard shelves and split surfaces.